Pastor Dennis Carlson and his brother Rod Carlson are teaming up for their fourth annual ride! 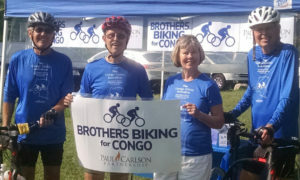 As Team BBC/ Brothers Biking for Congo, they will again be raising funds for the Paul Carlson Partnership’s Congo Clinic Initiative and rural health care in one of the poorest nations on earth,D.R. Congo. The Congo Clinic Initiative is a partnership with churches, groups and families to increase access to medical care by developing village clinics and to provide essential resources to raise the standard of care throughout Congo’s Équateur Province. 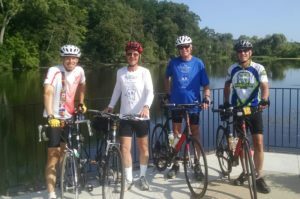 Support Team BBC in raising funds for rural health care in Congo! 1. Click HERE to donate online. Choose “Other” in the dropdown box and type “Congo Clinic Initiative” in the comment box. 2. By check: please make your check payable to “Faith Covenant Church” and write “Brothers Biking for Congo” on the memo line. …..35415 W. 14 Mile Rd. Obstacle: Medical care is inaccessible for the 1.6 million people in Congo’s Équateur Province. Typically, the closest hospital is a ten-mile walk and local village clinics lack basic necessities. The clinics operate without electricity or clean water. Medicines and supplies are available only intermittently. Curable illnesses take lives every day. Objective: To increase access to medical care by developing the village clinics and to provide essential resources to raise the standard of care. We are seeking partners for a united and coordinated effort. Together we can overcome this tragic reality.